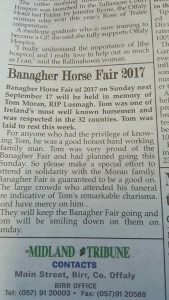 The Banagher Horse Fair of 2017 as expected was a great success, with one of the largest turn outs seen in recent years, as a poignant tribute was paid to the late Tom Moran, a countrywide known trader from Lusmagh. As the Angelus bell rang at midday, a hush came over the assembled crowd of visitors and traders which had swelled to near its maximum in numbers, as a minutes silence was respected, hastily organised by word of mouth, text, and tweet online over the previous few days. Even the horses were quiet. Tom was a regular feature of the Fair and many others nationwide, and was preparing for the Fair when he passed away suddenly, to the shock of family and friends. 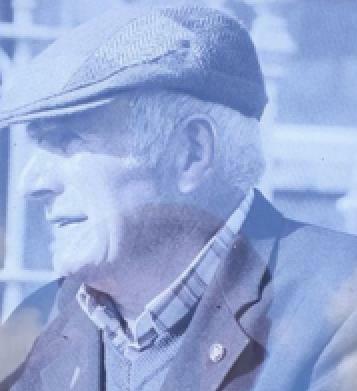 His family made sure to bring his stock to the fair as he had intended to do, and traders said that the 2017 Banagher Horse Fair would be held in his memory. We truly never know the day nor the hour. The fair started off with Gathering Day, the day previous when some out of town lorries arrived and along with locals got positions close to the days trading to come. Locals were washing their stock in the Shannon in preparation for the Fair, and when coming out of the Marina they got stopped by the local constabulary who made their presence known. Somewhere, for lack of a police presence, criminals had a free reign as the policeman did his best to find something amiss with the lorry or its occupants, but as usual they failed, as horse dealers are hard working decent people, like all other farmers bar their stock is horses, and margins are tighter and grants less, if any at all. 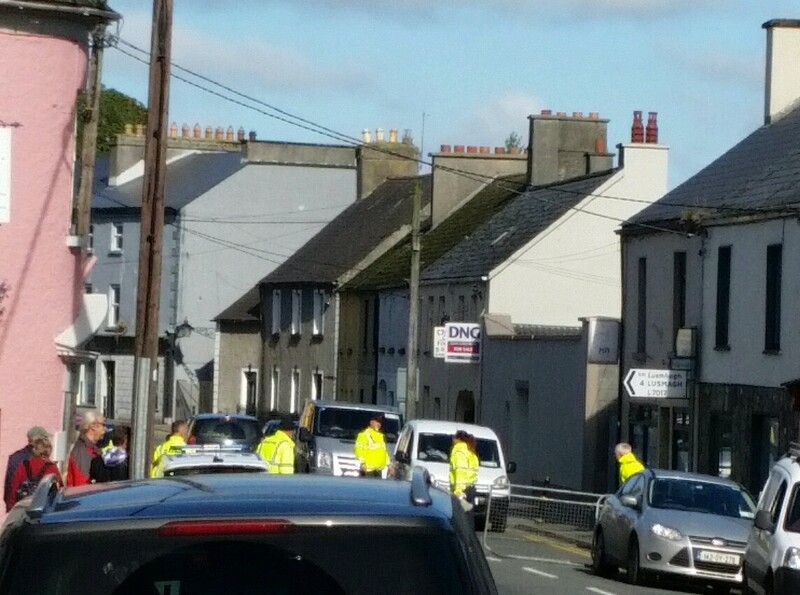 There was reports of a lorry surrounded and checked over as is they were full of contraband as they came in from Cloghan, and one Garda in particular (and its not the friendly sergeant this time!!!) will have his name in front of the Ombudsman for his behaviour towards motorists at the Crank House checkpoint. Apart from a few fines for missing L and N plates, they caught very little wrongdoers, and would not put on such a display for a GAA or soccer match, and its hard not to think its just to target fair goers out of begrudgery and such thinking, a horrific way to waste taxpayers money. That’s OUR money. Its beats Banagher that we are the only town where the officials are turning away tourists and traders in the middle of a recession. We had the support of many politicians, and the very welcome presence of Michael Fitzmaurice TD who had a great chat with traders and locals, Carol Nolan TD was present this year as well as Sean Maher, both of whom have given us great support throughout the past difficult few years. The “Driving For a Better Future” crew were in town, many of them stalwarts of our Horse Fair, and with them was the magician Keith Barry, who memorably entertained the crowds, as he does so well. They have a trot to raise funds from Dublin to Ballinasloe and will be going through Tullamore, and its a cause that we are happy to support, and it was sad to see even their wagon and horse were hassled by the “passports for horses” brigade outside St Pauls Church of Ireland at the top of the town. There was a strong days trading of horses, great animals on show, John Dolan had his hens, there was a pidgeon seller, a Romani woman and her daughter selling toys, balloons and more, saddelry, and other stuff on sale as well, as Bobs Burgers kept us well fed as in previous years! As traders parted and met up for drinks after, the absent traders of former years were remembered, foremost the late Tom Moran. 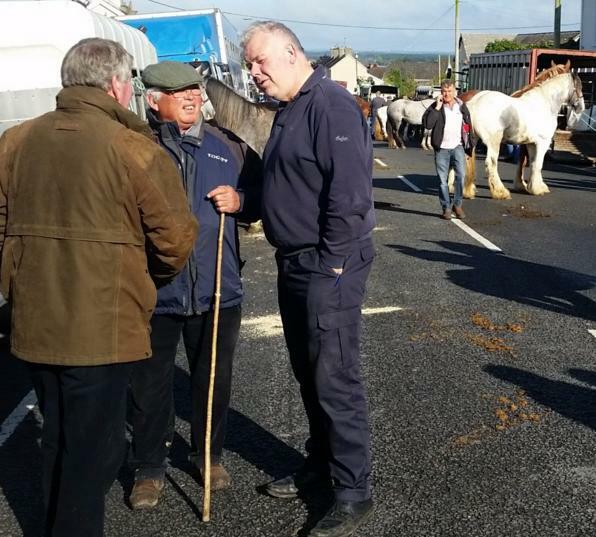 As traders said, this Fair was for him, as in former times him and a few others kept the fair going when it nearly died due to a lack of trade in horses during the 60’s, and its that tradition against the odds that we keep the fair going on. Small towns and country areas need self belief, and this is represented brilliantly in the Banagher Fair. No one says it will save the local or national economy, but it does its bit, and it is a lovely family tradition. The youths present and enjoying the fair show it has a bright future, the lest legacy of Tom Moran and the other traders who are gone before us. The 2018 Fair is on 16th of September next year.